I have always been led around by my nose. I still remember the enchantment of my first aromas: freshly ground coffee, honeysuckle, the ocean air, and bread baking. And I was always passionate about what I ate. When I was a very little girl, I experienced flavors so intensely that my young palate could not tolerate most of them. But as I got older I began to delight in many foods and was intrigued to discover the importance of smell to taste. The first time I heard of perfumer Mandy Aftel was many years ago, when eating at Daniel Patterson's first San Francisco restaurant Elizabeth Daniel. One of the courses was accompanied by a tiny vial of an exotic essential oil that we were encouraged to smell as we tasted the food. The blending of the aroma and taste was surprisingly sensational. Chef Patterson went on to coauthor a book with Mandy which was published by Artisan 10 years ago: Aroma: The Magic of Essential Oils in Foods and Fragrance. I was so impressed by the groundbreaking creativity of these two artists that we became lasting friends. When Daniel got married I was inspired to fly to the west coast and create a wedding cake that became the most beautiful and unusual of all the cakes in my book Rose's Heavenly Cakes. And Mandy, from time to time, sends me samples of her extraordinary essential oils and sprays for experimenting in my baking and cooking. It is amazing how a drop of essential oil of basil, or a tiny spritz of cepe, transform and enhance a dish. And a drop of her essential oil of vanilla on a sugar cube, stored with a cake after baking, infuses into the entire cake. Just as one of the major secrets of great chocolate or coffee producers, is access to the rare and limited supplies of the best beans, Mandy's access to the sources of her aromatic ingredients gives her the special palate with which to create and blend her aromas. 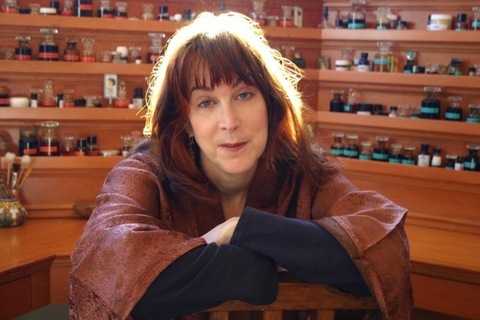 She has been featured in several magazines including a major feature in Vogue Magazine, and is the author of several books on the subject of aroma. Last year Mandy created a perfume for me combining two of my favorite aromas: sandalwood and jasmine. I couldn't imagine how the two would intermingle but that is the magic of her exceptional talent. And recently She created a multi award winning perfume to which I became completely addicted: Cuir de Gardenia Extrait. I start each day with a drop rubbing it between my wrists and can still smell its lingering fragrance at bedtime. If my taste can be defined by one essential aroma, this is it. Words cannot do it justice but the closest I can come is: alluringly ethereal floral notes perfectly balanced by an elegantly exotic warm base. It suggests the promise of wonderful secret discoveries. And I want to live in this smell forever. When I asked Mandy why she named the gardenia essence 'cuir' which means leather in french, she explained that is is because it has beaver castoreum which has the smell of leather and had been used for hundreds of years in perfume but is now rarely used. Mandy is a poet, a philosopher, an alchemist, a magician, and a beautiful friend. For more information, go to aftelier.